With approvals granted and contractors in place, Port Botany’s expansion is about to gather momentum. Charles Pauka spoke to Sydney Ports Corporation’s new CEO, Grant Gilfillan. Sydney Ports is expanding the container terminals in Botany Bay to meet forecast trade increases. The Port Botany Expansion Project (PBE) is located on the northeastern edge of Botany Bay, between the existing container terminals at Brotherson Dock and the parallel runway at Sydney Airport. Port Botany currently has six container terminal berths with two stevedores, Patrick (Asciano) and DP World (formerly P&O) servicing the arriving container ships. Final planning approval was given for the five-berth, 63-ha container terminal project in 2006. The new container terminal will extend approximately 550 m west and 1,300 m north of the existing Patrick Stevedores container terminal. About 1,850 m of additional wharf face with five new shipping berths will be constructed, with dedicated road and rail access. Reclamation work adjacent to Foreshore Road will create a tug and support vessel berth facility. In addition to the works associated with the provision of the new container terminal, Sydney Ports will undertake a number of public amenity and foreshore enhancement works adjacent to the new terminal development. These include reclamation of approximately 2 ha adjacent to the tug berth facility to create a new public boat ramp and car park with direct access to Foreshore Road, restoration and enhancement of Foreshore Beach and adjoining landscaped area, and ecological habitat enhancement works within Penrhyn Estuary and the channel separating the new terminal area from the existing shoreline. The principal contractor, dredger and project verifiers have all been appointed, who are now completing the engineering design phase of the project. The planned depth is down to 17 metres, which will allow unrestricted berthing for all vessel sizes likely to visit the port. Site preparation will begin in the third quarter of this year, with an expected completion date of end 2011. Development of the terminal facilities including paving and internal road works, installation of container handling equipment, terminal buildings and internal services reticulation will be the responsibility of the terminal operator(s) of the new facilities, which is likely to take another year after that. The choice of the stevedore to operate the new facility, a contentious issue in the freight community, is open to tender. Sydney Ports CEO Grant Gilfillan said it will be an open tender process. “The NSW Government or ourselves haven’t made any decision on the stevedore for the new facility,” he said. “The thinking is, for reasons of probity, it must be an open tender so neither of the current operators, Patrick or DP World, have been excluded. There won’t be anyone excluded from the initial process of registration and, there’ll be a process of refining that down to a preferred number of serious bidders on the basis of the criteria that we set for what’s required there. “That’s a belief that some still hold to, that these national coastal contracts are a strong marketing tool for the duopoly. But I don’t agree. I think you can be a successful stevedore in one port if you provide a good level of service, and I think shipping lines will seriously look at each individual port at what’s on offer. 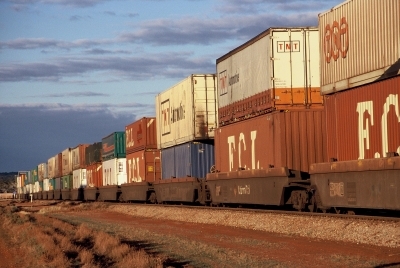 “That was my experience in Brisbane with CSX – it only managed to capture about 50,000 TEU out of a market of about 300,000 at the time, but that was sufficient to get started and it was sustainable and it could have grown over time,” he said. Sydney Ports expects the tender for the new stevedore to be issued around the middle of this year, which will be followed by a selection process that is expected to take several months. Mr Gilfillan is hopeful to have the tender awarded by the end of the third quarter, but if not, certainly by the end of the year. The preliminary Independent Regulatory and Pricing Tribunal (IPART) report, looking into container flows to and from Port Botany, recommended a system of reverse auctions in order to smooth the demand curve for truck slots. While this idea has met with widespread disdain from the industry, Mr Gilfillan believes it has merit and should be given a run. “My own view is that I wouldn’t be against any option until I understand fully how it will work. I hear on the one hand criticism of the existing system, which is first in best dressed, is that people don’t like to sit at computer terminals and wait ‘til one second past eight in the morning to try and scramble and get timeslots. I agree that’s not a very good way to run a business. “So what is the alternative? The only alternative is a system where you bid for these slots based on some value. So the challenge is really only to have an auction process that’s easy enough to follow and that delivers the outcome. And that’s an issue of how, not whether to do it or not. But standby queues also have their place. Mr Gilfillan said this flexibility is very important to operators: “We must ensure we don’t lose those flexibilities in any new system that tries to achieve discipline and rigour. That’s good, but don’t as a consequence of that lose this ability to be fleet-footed, which the stevedores have and the transport companies have as well. “That ability probably accounts for 10% of the movements so if we’re running at 70% efficiency and we strive to get it to 90% by putting more discipline in place, let’s not lose the 10% flexibility that we have,” he said. “It’s about being able to plan your business so if you’re a truck driver and you know what’s going on, you can look at the statistics for yesterday and see ‘yesterday there were three ships in discharging, today’s going to be a difficult day’, so you have a chance to plan. With the berth space at Port Botany almost doubling, container interchange will become an even more critical issue. Along with a significant improvement in rail transfer (see article starting on page 48), the stevedores will have to lift their game if a total collapse of the system is to be avoided. Excerpted from Australasian Freight Logistics, Issue 11, April/May 2008, pp.34-5.